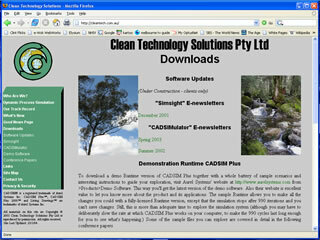 Cleantech required a professional site with detailed technical information presented in a readable fashion along with News and Download areas to keep their clients informed. When we started planning our website we had only vague ideas of how it might look (and even of what it might contain). It was something we knew we needed to do but getting everything together seemed a daunting task. Could this guy Warwick (Wok) who'd done websites for musical and artistic organizations be the right developer for us? After an initial meeting (where he helped us clarify some of our ideas) we gave him our initial thoughts in text form and let him play with the layout and presentation. It was surprising and pleasing to see how quickly it came together in a draft form which we could review in html on a "work-in-progress" site. That prompted us to think more broadly and try out some new ideas. What impressed us most was Wok's flexibility in coping with our changing ideas and his willingness to go with us while at the same time offering guidance and advice. He kept us briefed on costs against estimate and also on anticipated variations as we added the inevitable "must haves".